We must be willing to fight for the right of all Americans to express their views, even when we disagree with them. We must encourage unfettered discussion of public issues and stand united to stop Facebook and others from attempting to censor/stifle/influence public debate. Rep. Gabbard was not among those Democrats — but she also didn’t raise her voice when conservative media exposed widespread censorship on the part of Silicon Valley, such as the release of Google’s “Good Censor” document, or the revelation that YouTube suppresses pro-life content in its search results. (One Google employee called the latter a “smoking gun” that proved political censorship). The censorship of Sen. Warren’s ads attracted support from conservative Republican Sen. Ted Cruz (R-TX), who was one of the earliest critics of big tech censorship in the Senate. Cruz has previously called for tech companies to have their legal immunities under Section 230 of the Communications Decency Act to be revoked if they discriminate on the basis of viewpoint, on the grounds that Section 230 is meant to protect neutral platforms, not publishers that are editing, filtering, and censoring user content. Like Sen. Warren, Sen. Cruz has also called for the breakup of tech giants. 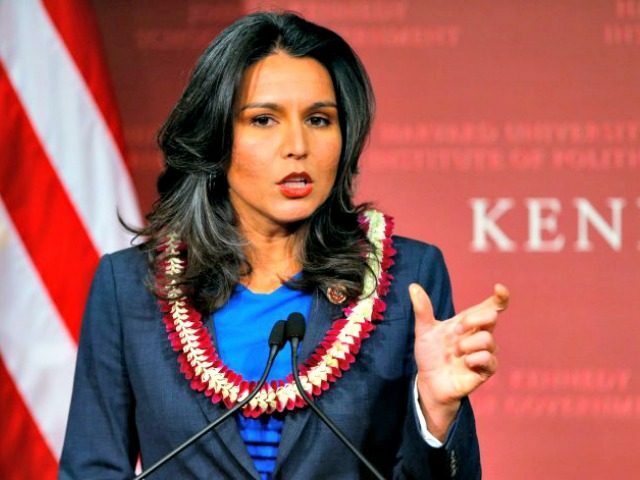 Rep. Gabbard, while a newcomer to the tech censorship debate, did not previously join her Democratic colleagues in recent months who falsely labeled conservative concerns about tech censorship a “conspiracy theory.” She is also widely seen as an anti-establishment candidate due to her anti-war stance — and some in the mainstream media have tried to link her candidacy to Russia.